When a movie uses a decades-old novelty toy as its inspiration, I don’t find myself filled with optimism that it’ll offer a creative masterpiece. This means went into 2016’s Trolls with fairly low expectations, but the film got pretty good reviews, so I figured it deserved a look. Trolls live contented, happy lives, but reality crashes down on them when the dour, miserable Bergens discover them. The much bigger Bergens learn that if they eat Trolls, they experience brief moments of bliss. This leads the Bergens to capture and imprison the Trolls for consumption purposes. However, Troll King Peppy (voiced by Jeffrey Tambor) leads his clan to escape and they manage to flee the Bergen peril. 20 years later, Peppy’s daughter Princess Poppy (Anna Kendrick) decides to throw a big party to commemorate their freedom. 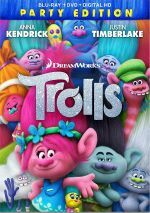 Branch (Justin Timberlake) – a rare grumpy Troll – protests because he believes this event will attract attention from the Bergens. Branch’s assumption proves correct, so the Bergens recapture some of the Trolls. Poppy and Branch manage to escape, and they must partner to free their friends. As I mentioned earlier, I figured a movie based on old novelty dolls wouldn’t offer much entertainment – and I think I was right. While the film comes with occasional moments of mirth, it lacks a lot of originality or verve. Trolls opts for the “throw everything at the wall and see what sticks” school of comedy. 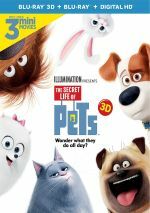 It offers a hyperactive affair packed with silly sight gags and random pop songs, all crammed together in one aggressive package. None of this makes Trolls terrible, but it threatens to wear out the viewer. The movie offers such a relentless compilation of music and frivolity that it gets old before long. It doesn’t help that Trolls does nothing to separate itself from the mold. The story and characters tend to mix and match influences from other efforts – some Shrek here, a little Cinderella there, and a lot of Smurfs all over the place. This absence of originality doesn’t become a fatal flaw, but it makes the end product seem awfully derivative. Trolls mixes attempts at sincerity with wacky asides and a bit of snark, factors that feel awfully predictable. Neither the story nor the characters manage to rise above this trite feel. We can see plot elements a mile in advance, and Trolls does nothing to enliven its choices. Everything goes exactly as one would anticipate, with nary a surprise in sight. Granted, I don’t look at animated tales like this for daring, edgy filmmaking, but I’d like something more original than Trolls. The movie feels mediocre and fails to turn into anything more than a forgettable conglomeration of inspirations. Trolls appears in an aspect ratio of approximately 2.35:1 on this Blu-ray Disc. Like most computer animated affairs, this one looked terrific. With a broad palette, Trolls offered delightful hues. The colors were vibrant and bright at all times, as they showed eye-popping vivacity. Blacks were deep and tight, while shadows appeared smooth and well-defined. This was a fine image. While not as strong, the film’s DTS-HD MA 7.1 worked well for the movie. The soundfield tended to focus on the front speakers, though the rear channels kicked to life at times. These occurred mostly during the occasional action scenes; we got good movement for all the antics on display. Otherwise, the music showed nice stereo dimensionality, and the track gave us a positive sense of place and involvement. We can watch Trolls in two alternate ways. Sing Along adds lyrics to the movie’s songs, while Party Mode adds other elements. It also includes the sing-along but it throws in additional interactive components the viewer activates via remote. Kids might like these options. Three Deleted Scenes fill a total of seven minutes, 24 seconds, a running time that includes introductions from director Mike Mitchell and co-director Walt Dohrn. We find “Story Time With Poppy”, “Bringing Back Happy” and “So Many Dresses”. “Happy” and “Dresses” offer production numbers that don’t work because they don’t fit their characters well. “Story” just makes the king look senile. None of them offer much entertainment. Mitchell and Dohrn give us good thoughts about the sequences and why they got the boot. A few featurettes follow. Travel Through Troll Village goes for four minutes, 43 seconds and provides an animated tour with “Cloud Guy”. It basically offers an overview of various movie characters. It’s cute but more or less worthless, as it tells us nothing we don’t know from the movie. During the five-minute, six-second The Potion for Stop-Motion, we hear from Dorhn, Mitchell, visual developer Priscilla Wong, and production designer Kendal Cronkhite-Shaindlin. “Potion” discusses the creation of the scenes that demonstrate Poppy’s “scrap-booking”. It becomes a quick but informative piece. Next comes Creating Troll Magic. It goes for five minutes, 21 seconds and offers info from Cronkhite-Shaindlin, Wong, Mitchell, and Dohrn. This connects to character and visual design and expands on “Potion”: to offer another brief but tight discussion. With Inside the Bunker, we locate a two-minute, 54-second reel that gives us another tour from “Cloud Guy”. It details Branch’s “survival bunker”. Like “Travel”, it lacks much value. Finally, Troll 2 Troll fills four minutes, 46 seconds. It gives us “debate” between Branch and Poppy about hot topics like “cats or dogs” and “early bird or night owl”. This breaks into six short promo reels, and they use original voice actors Anna Kendrick and Justin Timberlake. The snippets offer minor amusement. The disc opens with ads for The Boss Baby, Sing, Home: Adventures With Tip and Oh, and Spirit: Riding Free. Sneak Peek adds clips for Voltron: Legendary Defender, Kung Fu Panda 3 and Home. We also get a trailer for Trolls. A second disc brings us a DVD copy of Trolls. It includes the “Travel”, “Motion” and “Magic” featurettes as well as some ads. As animated comedies go, the best I can say about Trolls is that I’ve seen worse. Without much originality or spark, the movie offers minor entertainment at best. The Blu-ray brings us excellent visuals as well as pretty good audio and mediocre supplements. Trolls fails to turn into a memorable affair.